Slimline double glazed units, either retrofitted into existing windows, or supplied with replacement sashes, is the most cost effective and hassle free way of improving the efficiency of your windows. It can give you the warmth and comfort of complete replacements at a reduced cost and has a lower carbon footprint. The slimline units we install are filled with krypton or xenon gas giving you the optimum thermal gain. This translates to a saving of around £170.00 per year on your heating bill. 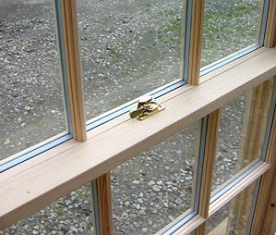 Other benefits of slimline double glazing include eliminating condensation and drastically reducing noise penetration. Noise penetration can be reduced by a further 25% if you choose the acoustic glass option. This works well to eliminate loud external noise such as road or air traffic. We can fit slimline double glazed units across the whole of Essex & London, so please give us a call today to see how we can help you.